A magic box with a never-ending supply of yarn? 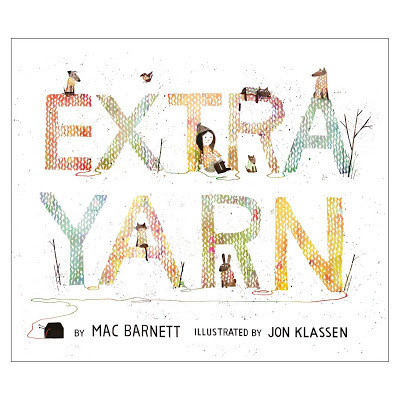 A little girl who knits sweaters for every living thing in her town? An evil archduke who wants the box for his own? Yes, please! Every knitter should have this book on their shelf. We are also loving Kate DiCamillo's The Miraculous Journey of Edward Tulane...I sat to read a bit of this while eating my lunch yesterday and read the whole book. A wonderful, wonderful read...one of those full-circle type stories with themes of attachment, abandonment, loss, grief, and of course, love. Jude's been into Greek Mythology so we've been reading up on King Midas and the Olympian Twelve. We may need to order a book that he can read himself! I've been playing Bingo at our library. We have a Bingo card with different types of books on each square (e.g. Read a book everyone has read but you, read a classic, read a book you heard about on the radio). I've read 14 books so far, and have 10 more to go. Right now I'm reading a book I should have read in high school: The Catcher in the Rye! And knitting? Well, I am afraid I don't have much time for that these days. I'm poking away at my sock (for those who asked last time, it's Regia World Circus, colour 3754! ), and am preparing to cast on for this Christmas project (because there's no sense in waiting till December, right?) This will take me awhile! I just love it and enjoy picturing it on top of our piano next winter. Please stop by Small Things to join in Ginny's Yarn Along! I remember when my middlest read Kate DiCamillo. Hazel and I have just finished listening to The Tale of Desperaux on cd. Thank goodness for the library! Very sweet Christmas project. Somehow I feel like I am all thumbs whenever I cast on with small yarn. Wishing you a lovely day - is it raining again in your neck of the woods? Cather In The Rye........wow a classic that I have read and you haven't read? There's a first :-) I have always thought of re-reading it form the perspective of a 41 year old as opposed to a 16 year old which is the age I was when I first read it. Let me know what you think although many of the details are faded by now in this mind of mine. Love the knitted nativity scene especially that camel! I LOVE that nativity scene! It would be GORGEOUS on your piano next winter. 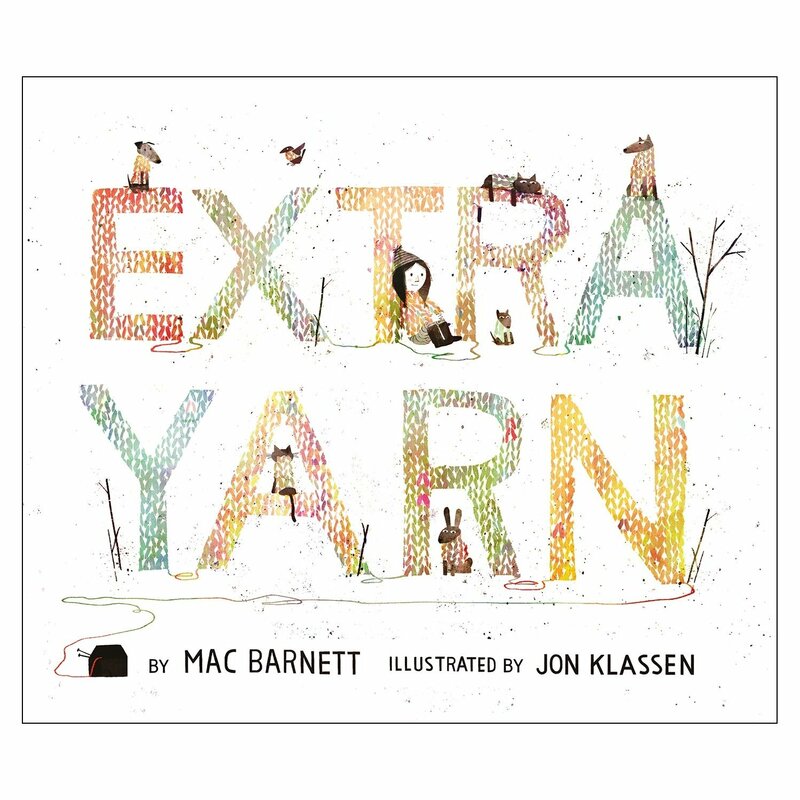 I just saw that book on display at our little country library over the weekend and wished I had a young one to check it out for...I skimmed it and thought how clever the illustrations are. Your nativity is amazing! Hey, I've read Extra Yarn, and Catcher in the Rye too! Though it's been so long since I've read Catcher in the Rye that the only thing bopping around in my brain about it is a hunter's hat(?) some kind of strange hat. That, and that I had a pristine, white, soft cover copy that I bought brand new, which would have (and still is) a rare treat. Thank you for the ball band details, off to google it! 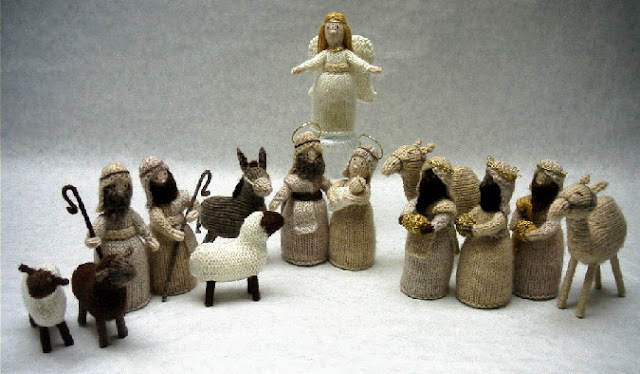 A friend of mine knit that nativity scene, it's a great pattern! As for Edward Tulane, I adore that book. The first time I read it was aloud to my kids in the backyard and I was sobbing so loudly I am sure I disturbed the neighbors. I love Extra Yarn- got it for my daughter for Christmas! What a coincidence - I cast on my nativity scene this week. Started with Mary in blue. Your socks are such a fun color. Okay, I need to hear more about this Book Bingo!! Did you make up the card or get it somewhere? That is so up my ally. Kate DiCamillo is on my "I must read soon" list since we have really enjoyed Desperaux in movie format and have read online that the book is much better (which is never surprising to hear). My husband listened aloud to Edward Tulane a few years ago and loved it. My kids aren't old enough to enjoy her books but I can't wait until they are since they sound like they'd make excellent read-alouds! The Nativity looks like such fun. Well, it looks a bit fiddly actually,but fun to HAVE when it's done! ooooh you've just given me an amazing idea to make my daughter practice her reading over the summer. Mythology is one of my pet subjects, and I have all kinds of books about it, including a kids' guide to Greek Mythology (which is about her reading level, grade 5 or so). My DIL told me about cutting up tiny bits of yarn and putting them in a bird feeder. She said the birds make their nests with the yarn. I picture the funniest things, like robins in handknit sox and the mourning doves wearing soft, little beanies! Have a ton of fun today!